We operate one such culinary tour of India with chef every month. 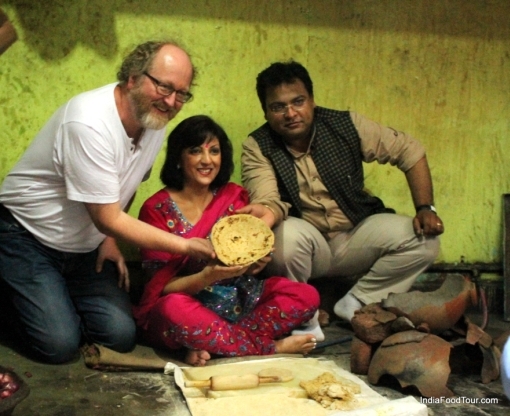 In these culinary tours, you will find a fantastic mixture of award winning food walks, sight seeing tours, cooking demos and various other activities and tours which give you a glimpse in to sights, people and culture of India. We keep the group size limited to a maximum of 16 to make sure that attention to detail is top notch. Chef Rajeev Goyal and his team lead all the culinary activities in all cities. One such tour will be organised every month for different destinations and activities which will vary according to season and demand. Places covered: Selection from New Delhi, Agra, Jaipur, Jodhpur, Udaipur, Kerala among a few others. Activities: Food tours, cooking classes, playtime with elephants, desert safaris, introduction to spices, horse rides, boating, camping. Differs from place to place. Accommodation: A mix of best heritage and boutique hotels, campsites, homestays. Meals: All meals included from food tours, top specialty restaurants and hotels. Includes special meals like one with royalty, local villagers, Indian families in some tours. Sightseeing: Major landmarks in each city addition to some hidden gems on the way like Sambhar lake. Dates: Begins from 16th of each month. Reporting on 15th. Last date for booking: 25th of preceding month. Following are itineraries for two of our tours to be held in December 2017 and January 2018.